Migrating to a low-tax state to retire doesn’t always allow people to escape estate and inheritance taxes in the states they left. As 2014 drew to a close, Florida finally pulled ahead of New York to become the nation’s third most populous state, following California and Texas. But retirees and others from northern states who take up residence in Florida and other sunny, low-tax states should not be surprised when their former home states are reluctant to see them go as taxpayers. State domicile typically arises in the context of not only state income taxes, but also state estate or inheritance taxes. Currently, 19 states and the District of Columbia impose estate or inheritance taxes, or both, in addition to the federal estate tax. These taxing authorities generally reach nonresident estates owning real estate or tangible personal property within their borders. Florida, Texas, and Nevada don’t have income taxes or estate taxes. For a retired snowbird, avoiding estate or inheritance taxes up north is not as simple as it would seem. Sometimes the individual didn’t cut enough ties to the old state, so he or she is still considered a resident. Individuals should be aware that they can be considered to be a resident in more than one state although they will be domiciled in only one state. Domicile is defined as a person’s fixed or permanent abode that the person intends to remain in indefinitely and to which the person intends to return. Residency is a much more flexible term and may be defined differently depending on the state. For example, some states determine residency by looking at whether a person has a permanent place of abode in the state and lives in it a certain number of days in the year. Just owning a vacant lot, other real property, or even tangible personal property located in another state can require a nonresident estate tax return to be filed, and the state exemption amount is often much lower than expected. Estate taxes generally apply a graduated tax rate schedule to the taxable value of a decedent’s total estate. Bequests to surviving spouses and charities are typically exempt from the tax, in addition to a dollar amount for exemption that applies to all other estate beneficiaries. While the federal estate tax laws appear to have finally stabilized, state estate taxes continue to be in flux. For 2015, a number of states made significant changes to their estate tax rules. For example, Maryland, Minnesota, and New York increased their exemption amounts. 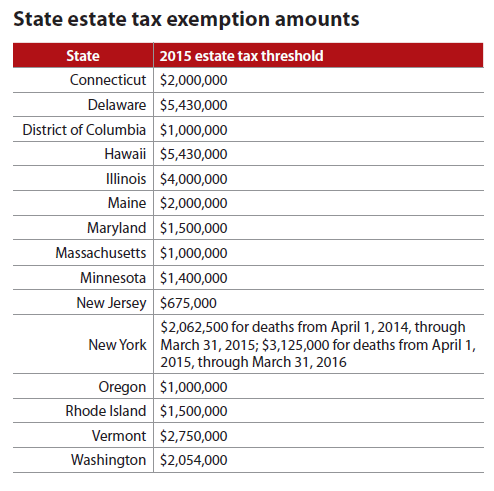 Most states’ exemption amounts are much lower than the federal estate tax exemption amount, which is inflation-adjusted and is $5.43 million for 2015 (see “State Estate Tax Exemption Amounts” for a complete list of estate tax thresholds around the country). New Jersey has the lowest exemption, $675,000, but it also does not impose its estate tax on nonresidents, even if they hold real or personal property in the state. It does, however, impose its inheritance tax on real or personal property located in New Jersey that a nonresident transfers at death, but not on intangible property. The filing requirement for a nonresident estate tax return in some states (including Connecticut and Maryland) generally kicks in when the value of the decedent’s worldwide assets exceeds that state’s exemption amount, not, as one might expect, when the value of the nonresident’s assets located in the state exceeds the exemption amount. This means, for example, that the estate of a Florida widow with $2.4 million cash and a vacant parcel of land in Connecticut worth $100,000 will have to file a Connecticut estate tax return and pay the state about $1,000 in tax. But there’s more bad news. Did the decedent ever live in Connecticut? If yes, list the periods. Did the decedent live part of the year in Connecticut and part of the year outside of Connecticut? Provide the place of the decedent’s death and burial. Attach copies of the decedent’s death certificate and obituaries in newspapers in ­Connecticut and elsewhere. List the name, address, and relationship of all the decedent’s family members with whom the decedent had the closest familial relationship. Did the decedent undergo medical treatment or examination in Connecticut at any time within the five years preceding death? If yes, furnish the name and address of the doctor or hospital and the dates of treatment(s) or examination(s). The questions on Form C-3 UGE and the fiduciary’s signed declaration under penalty of law are designed to uncover decedents with enough connections to Connecticut for the state to make a case that the entire estate is subject to Connecticut estate tax. What happens if the Connecticut estate tax return and the Form C-3 UGE aren’t filed? An estate tax lien discharge that is required to sell the real property might not be granted until the filings are properly done (or a Connecticut attorney or corporate fiduciary otherwise applies for the discharge of Connecticut’s estate tax lien). As if rounding up the decedent’s Connecticut medical records—and obituaries published around the world—were not burdensome enough, the Connecticut estate tax return instructions require an attached copy of the completed federal estate tax return (Form 706, United States Estate (and Generation-Skipping Transfer) Tax Return), even though the higher federal estate tax exemption amount means Form 706 does not have to be filed with the IRS. Depending on the complexity of the decedent’s assets, preparing Form 706 can be time-consuming. That’s another costly undertaking that is surprising for a nontaxable Florida estate. In New York, the estate’s representative or a family member must file a Form ET-141, New York State Estate Tax Domicile Affidavit, which asks for the decedent’s address at the date of death and whether the decedent ever lived in New York or owned any real property in the state. The form also requires, for the five years preceding death, the decedent’s residences; voting locations; federal, state, and local income tax return filing places; the location of any business or employment; and whether the decedent owned a safe deposit box in New York at the time of death. Finally, the form asks about clubs or organizations the decedent belonged to, whether he or she had been a party in any legal proceedings in New York in the last five years, and whether and where the decedent had a business or professional license or a license to operate a car, boat, or airplane. If the decedent had listed his or her address on any trust indentures, deeds, or mortgages in the past five years, a copy of those documents must be provided. Although the affidavit is not sworn to under penalties of perjury, the signer must attest that all the answers are “true in every particular,” and the affidavit must be notarized. Massachusetts requires nonresident decedents’ estates to file Form M-NRA, Massachusetts Nonresident Decedent Affidavit, which asks, among other things, where the decedent was born and died, where he or she is buried, and where surviving family members live. Similar to the New York questionnaire, Form M-NRA asks where the decedent lived, worked, voted, and filed his or her tax returns for the five years before death and whether he or she belonged to any organizations. Like the Connecticut form, Massachusetts asks whether the decedent had any medical treatment in the state in the five years before death. A number of states impose inheritance taxes, with maximum rates ranging from 9.5% to 18%. These states include Iowa, Kentucky, Maryland, Nebraska, New Jersey, Pennsylvania, and Tennessee. Tennessee’s inheritance tax (which functions much like an estate tax) will be eliminated beginning in 2016. Unlike estate taxes, inheritance taxes are typically paid by the beneficiaries. Maryland and New Jersey have both inheritance and estate taxes. What should someone who owns property located in another jurisdiction do to avoid the transfer taxes and related administrative hassles? Obviously, the property could be sold, but that’s not always possible or desirable. The property could be gifted to the person intended to inherit it, but that could have undesirable tax consequences for the recipient. Depending on the property’s value, a federal gift tax return would be required. Connecticut, which is now the only state that imposes a gift tax, would also require a gift tax return for gifts of property located in the state. Another option may be to transfer the property to an irrevocable trust, a limited liability company, or a corporate entity, depending on the state where the property is located. Florida retirees who want to avoid income taxes in the states they moved from are commonly advised to apply for the Florida homestead exemption, obtain a Florida driver’s license, and register to vote in the Sunshine State. But many of these new Floridians still own homes and other property in other jurisdictions, frequently traveling back and forth with the changing seasons. It’s not unheard of for a snowbird to die in his or her hometown, surrounded by close family, and be buried there. Some people who move to Florida wind up back where they came from, perhaps moving to a nursing home near relatives. Clearly, moving to Florida doesn’t mean never paying estate tax to another jurisdiction. Recent changes to the federal tax Code have reduced or eliminated the federal estate tax for many taxpayers. However, lurking in the background are the many estate and inheritance taxes imposed by 19 states and the District of Columbia. Some of these jurisdictions’ exemption amounts are shockingly low, especially for nonresident estates. Awareness and careful planning could go far to avoid an unwelcome surprise. Liz Opalka (liz.opalka@quarles.com) is a trusts and estates paralegal for Quarles & Brady LLP in Naples, Fla.
For more information or to make a purchase, go to cpa2biz.comor call the Institute at 888-777-7077. The Tax Adviser is available at a reduced subscription price to members of the Tax Section, which provides tools, technologies, and peer interaction to CPA’s with tax practices. More than 23,000 CPAs are Tax Section members. The Section keeps members up to date on tax legislative and regulatory developments. Visit the Tax Center at aicpa.org/tax. The current issue of The Tax Adviser is available at thetaxadviser.com.